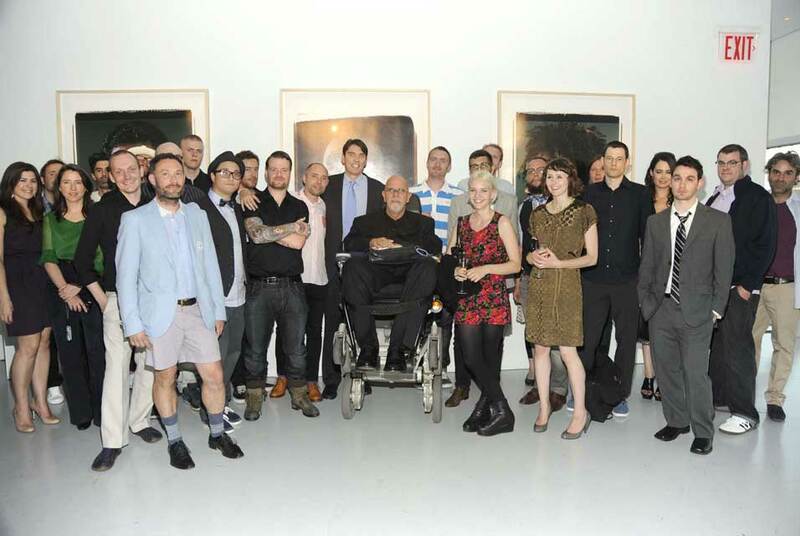 Chuck Close poses with a group of artists. NEW YORK, NY.- Last night, May 26, AOL celebrated its 25th Anniversary as the company kicked off its Project on Creativity with legendary American artist Chuck Close at the New Museum. With over 600 guests in attendance, the worlds of art, media, and technology converged en masse to celebrate the pioneering internet brands historic birthday. Guests including Andy Spade, Kate Spade, Bettina Zilkha, Lisa Anastos, Genevieve Jones, Nejima Beard, Francesca Bodini, Simon Hammerstein, Jennifer Missoni, Luca Bonetti, Jean-Philippe Delhomme, Will Cotton, Kate Schelter, Jamie Johnson, Doutzen Kroes, Waris Ahlualia, Zuleikha Robinson, Glenn OBrien, Gina Nanni, Christine Teigen and Bill Powers joined AOL CEO Tim Armstrong to enjoy the festivities. Following the New Museum fete, AOL employees and guests were treated to an intimate performance by international recording artist John Legend at the Bowery Hotel. The landmark event featured portraits photographed by Close of some of the worlds leading innovators and creative visionaries, including the Dalai Lama, Inventor Dean Kamen, Director Gus Van Sant, Actress Claire Danes, Artist Kara Walker and the artist himself. These portraits are representative of the work that Close will be creating as part of the Project on Creativity  a larger initiative that includes collaborations between AOL and Close on exclusive online content; a 25 for 25 scholarship program, which will grant 25 $25,000 scholarships to tomorrows journalists, artists, illustrators, chefs, producers, videographers, and editors; a groundbreaking conference in New York City later this year, which will yield discussion about the relationship between creativity and technology; and a media campaign utilizing portraits by Close of world class creatives and innovators. In addition to exhibiting the work of Close, as part of the Project on Creativity, AOL unveiled its 2nd Collection  an initiative through which AOL engaged 41 hand-selected artists of varying disciplines from around the world who created original artwork to be revealed behind the AOL Brand. The original artwork will be featured on AOLs homepage and products as well as AOLArtists.com, a new destination where users can learn more about how AOL is using creative expression across their sites and the artists who created those expressions. At the New Museum, AOL brought to life four of the pieces in the 2nd Collection, displaying three dimensional works from artists Phillip Low, James Taylor, Rachael Thomas and Dave White. Additionally, the entire 2nd Collection was displayed through digital portraiture on a 25-foot video wall. The Project on Creativity was conceptualized collaboratively between AOL and Partners & Spade, a studio founded by Andy Spade and Anthony Sperduti focusing on design, film and content. Partnering with Chuck Close was the ideal way for AOL to celebrate its achievements while looking forward to its future within the creativity community. Andy and I are very impressed by the direction Tim has chosen for AOL  bettering the internet through supporting creativity in all its forms, said Partners & Spade Principal Anthony Sperduti. An Impressive Gold Coin from the Reign of Napoleon III was Discovered.